Kanheri caves are located on the north of Borivli in Mumbai. 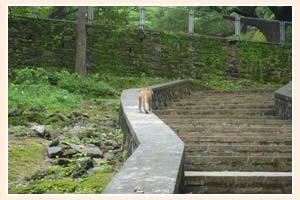 It is in middle of the green forest of the Sanjay Gandhi National Park. These caves are basically Buddhist caves where Buddhist monks around the first century A.D. used to practise austerities. There are more than 100 small caves fitted with the stone base. The caves feature a huge Buddha statue of 7 meter. Glimpses of the lifestyle of the Buddhist monks can be sited on the walls of the caves. The inscriptions that are found in the cave walls are in Devnagiri, Pallava and Brahmi scripts. The caves are wonderful both in terms of art work and architecture.